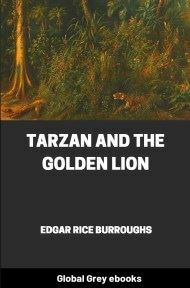 Tarzan and the Golden Lion is the ninth in the series of books about the title character Tarzan. 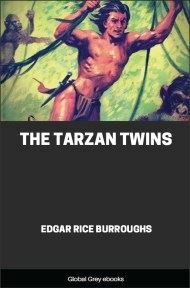 In the previous novel, Tarzan rescued Jane after he discovered that she was alive, and was reunited with his son Korak. 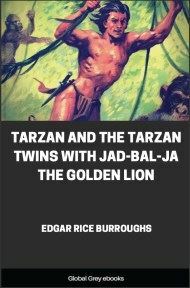 In this story he and his family encounter and adopt an orphaned lion cub, whom they name Jad-bal-ja ("The Golden Lion" in the language of the lost land of Pal-ul-don, which they have recently left). Sabor, the lioness, suckled her young—a single fuzzy ball, spotted like Sheeta, the leopard. She lay in the warm sunshine before the rocky cavern that was her lair, stretched out upon her side with half closed eyes, yet Sabor was alert. There had been three of these little, fuzzy balls at first—two daughters and a son—and Sabor and Numa, their sire, had been proud of them; proud and happy. But kills had not been plentiful, and Sabor, undernourished, had been unable to produce sufficient milk to nourish properly three lusty cubs, and then a cold rain had come, and the little ones had sickened. Only the strongest survived—the two daughters had died. Sabor had mourned, pacing to and fro beside the pitiful bits of bedraggled fur, whining moaning. Now and again she would nose them with her muzzle as though she would awaken them from the long sleep that knows no waking. At last, however, she abandoned her efforts, and now her whole savage heart was filled with concern for the little male cub that remained to her. That was why Sabor was more alert than usual. Numa, the lion, was away. Two nights before he had made a kill and dragged it to their lair and last night he had fared forth again, but he had not returned. Sabor was thinking, as she half dozed, of Wappi, the plump antelope, that her splendid mate might this very minute be dragging through the tangled jungle to her. Or perhaps it would be Pacco, the zebra, whose flesh was the best beloved of her kind—juicy, succulent Pacco. Sabor's mouth watered. Ah, what was that? The shadow of a sound had come to those keen ears. She raised her head, cocking it first upon one side and then the other, as with up–pricked ears she sought to catch the faintest repetition of that which had disturbed her. Her nose sniffed the air. There was but the suggestion of a breeze, but what there was moved toward her from the direction of the sound she had heard, and which she still heard in a slightly increasing volume that told her that whatever was making it was approaching her. As it drew closer the beast's nervousness increased and she rolled over on her belly, shutting off the milk supply from the cub, which vented its disapproval in miniature growls until a low, querulous whine from the lioness silenced him, then he stood at her side, looking first at her and then in the direction toward which she looked, cocking his little head first on one side and then on the other. Evidently there was a disturbing quality in the sound that Sabor heard–[–]something that inspired a certain restlessness, if not actual apprehension—though she could not be sure as yet that it boded ill. It might be her great lord returning, but it did not sound like the movement of a lion, certainly not like a lion dragging a heavy kill. She glanced at her cub, breathing as she did so a plaintive whine. There was always the fear that some danger menaced him—this last of her little family—but she, Sabor the lioness, was there to defend him. Presently the breeze brought to her nostrils the scent–spoor of the thing that moved toward her through the jungle. 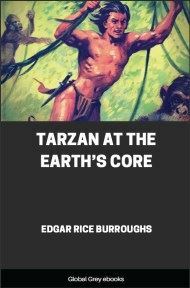 Instantly the troubled mother–face was metamorphosed into a bare–fanged, glittering–eyed mask of savage rage, for the scent that had come up to her through the jungle was the hated man–scent. She rose to her feet, her head flattened, her sinuous tail twitching nervously. Through that strange medium by which animals communicate with one another she cautioned her cub to lie down and remain where he was until she returned, then she moved rapidly and[dele.] silently to meet the intruder. The cub had heard what its mother heard and now he caught the smell of man—an unfamiliar smell that had never impinged upon his nostrils before, yet a smell that he knew at once for that of an enemy—a smell that brought a reaction as typical as that which marked the attitude of the grown lioness, bringing the hairs along his little spine erect and baring his tiny fangs. As the adult moved quickly and stealthily into the underbrush the small cub, ignoring her injunction, followed after her, his hind quarters wobbling from side to side, after the manner of the very young of his kind, the ridiculous gait comporting ill with the dignified bearing of his fore quarters; but the lioness, intent upon that which lay before her, did not know that he followed her. 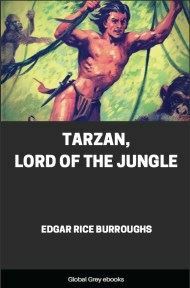 There was dense jungle before the two for a hundred yards, but through it the lions had worn a tunnel–like path to their lair; and then there was a small clearing through which ran a well–worn jungle trail, out of the jungle at one end of the clearing and into the jungle again at the other. As Sabor reached the clearing she saw the object of her fear and hatred well within it. What if the man–thing were not hunting her or hers? What if he even dreamed not of their presence? These facts were as nothing to Sabor, the lioness, today.[dele.] Ordinarily she would have let him pass unmolested, so long as he did not come close enough to threaten the safety of her cub; or, cubless, she would have slunk away at the first intimation of his approach. But today the lioness was nervous and fearful—fearful because of the single cub that remained to her—her maternal instincts centered threefold, perhaps, upon this lone and triply loved survivor —and so she did not wait for the man to threaten the safety of her little one; but instead she moved to meet him and to stop him. From the soft mother she had become a terrifying creature of destruction, her brain obsessed by a single thought—to kill.